Jordan Werner Barry is a freelance podcast producer and food writer. She is interested in pursuing stories that sit in the intersection of food and culture—particularly if they involve fermentation. It seems only natural—and appropriately poetic—to start this season talking about starters. They’re the inception of the loaf, the first step. You don’t need a starter to make bread, but the story of cultivating yeast from the environment around us—whether you call it “starter,” “culture,” “levain,” or “mother”—is what we’re focusing on in this episode, from microbes to miche. We’ll hear from Executive Producer Michael Harlan Turkell about his “mother,” baker Sarah Owens about her “Beast,” microbial ecologists Dr. Erin McKenney and Dr. Rob Dunn of The Sourdough Project, and, of course, co-authors of Modernist Bread, Nathan Myhrvold and Francisco Migoya. Maple syrup is having a moment: in cooking, baking, and wellness culture. Michael Harlan Turkell talks to experts about the tapping process and learns more about the maple water trend, sugar shacks in Montreal, and Korean gorosoe. Plus: Co-producer Jordan Werner Barry goes into the snowy woods of Vermont. This zesty, 15-minute weekly update on food stories and commentary is modeled after the Southern meat-and-three-sides concept: a deep dive and three shorts. Keep up with the latest food trends, the political economy and societal impact of food, health news, and more. Join us as we explore what the fork is going on in the world right now. 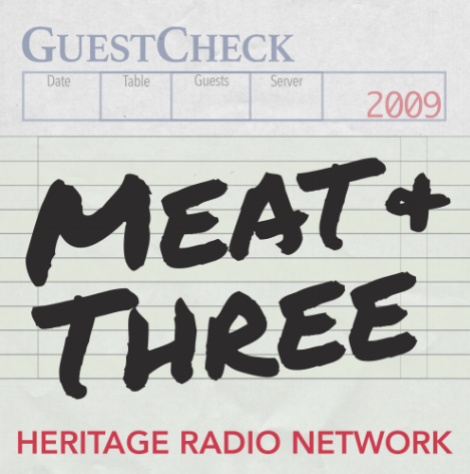 Meat + Three is the voice of Heritage Radio Network, a Brooklyn-based nonprofit food media mecca with over 35 weekly food shows and a mission to make the world more equitable, sustainable, and delicious. Life, liberty, and the pursuit of cider? That may not be quite how the final draft of the Declaration of Independence turned out, but American Independence, and maybe even the Declaration’s writing, was fueled by fermented apples. Today, America’s cider industry is holding on to that independent streak, carving out an identity in a crowded market of beer and wine drinkers. The industry has grown from near nonexistence after Prohibition to more than 800 cideries in 48 states. That independence carries through to cider media, too, in the form of an independently published, print-only, advertisement-free cider zine: Malus. In the season finale of Modernist BreadCrumbs, we’re exploring the intersection of bread and art, and the idea of bread as art. From Renaissance paintings of The Last Supper (complete with pretzels) and still lifes from the Dutch Golden Age to scoring videos on Instagram—the aesthetics of bread, and all that it symbolizes, have long been on display. We’ll look for bread in art history with Maite Gomez-Rejon (founder of Art Bites), consider the influence of art on baking with an interview from HRN Happy Hour featuring head chef of Modernist Cuisine Francisco Migoya and author Daniel Isengart, talk about craft with baker (and former ceramic artist) Sarah Owens, weigh bread’s artistic value with Guy Frenkel of Ceor Bread, and find out how co-authors Nathan Myhrvold and Francisco Migoya, tackled bread’s beige aesthetics when writing Modernist Bread. It’s a season of celebration, and no matter what you’re celebrating, that usually means baking. Sweet or savory, traditional or cutting-edge, more people fire up their ovens during the holiday season than any other time of the year. In this episode, we’re exploring holiday breads and the traditions that bring us back to them, year after year. We’ll talk Stollen with Brian Hart Hoffman of Bake From Scratch Magazine, Challah with Mike Zaro of Zaro’s Bakery, and Pandoro vs Panettone with Italian baker Luigi Biasetto. Co-authors of Modernist Bread, Nathan Myhrvold and Francisco Migoya, help us figure out what the holiday hoopla is all about—is it just nostalgia, or something deeper? We’re going down the rabbit hole of breads with holes! From the New York vs Montreal bagel debate—and the power of water and lye—to the twists and turns of pretzel history, focusing on the presence of negative space is a positive thing. We’ll explore the power of lye with Harold McGee, check out NYC bagel culture with Dianna Daoheung of Black Seed Bagels, learn about the Simit with Zoe Kanan, and head to Pennsylvania’s classic Julius Sturgis Pretzel Bakery. Along the way, Nathan Myhrvold and Francisco Migoya, co-authors of Modernist Bread, will address “the water myth,” and their findings may surprise NYC bagel purists. Featured in this episode are Sandy Whann of Leidenheimer Baking Company, Alison Pray of Standard Baking Company, chef Travis Milton, author Ronni Lundy, and, of course, co-authors of Modernist Bread, Francisco Migoya & Nathan Myhrvold. Flatbreads and quick breads may seem like strange oven-fellows, but hear us out. In the venn diagram of bread baking, they both fall in the overlap of “speed” and “differently leavened.” So we’re firing up the tonir, the tandoor, the griddle, the bastible, the wok, and even a rock, to travel around the world through bread. We’ll chat flatbreads with chef Mike Solomonov of Zahav, head baker Peiwen Lee of Hot Bread Kitchen, and author Kate Leahy of the forthcoming Lavash. Then, producer-at-large Conor O’Donovan will dive deep into Irish Soda Bread with Darina Allen of The Ballymaloe Cookery School, and cookbook historian Dorothy Cashman. And, as always, we’ll hear insights from Modernist Bread from co-authors Nathan Myhrvold and Francisco Migoya. Explore the gray areas of fermentation: the intersection of cider, wine and beer. Held by Heritage Radio Network to celebrate Cider Week NYC and RAW Wine NY, Co-Ferment was a tasting and panel discussion led by Jordan Werner Barry and Daniel Pucci that focused on the ways that these seemingly different beverages overlap—production methods, farming, flavor, culture, and the language we use to talk about them. On location at RAW Wine NY, this Speakers’ Corner panel features Mikael Nypelius (Fruktstereo), Todd Cavallo (Wild Arc Farm) and Polly Giragosian (Aaron Burr Cider). Moderated by Jordan Barry. Cider—from production to consumption—is stuck in between grapes and grain. It is sold both in cans and in wine bottles, dive bars and wine shops. Styles range from hopped “IPCs” to naturally-fermented and orchard-based vinous ciders. But which industry is it more closely aligned with? How might cider overcome its sweet, beer-alternative image to highlight apple varieties, regionality, and terroir? This panel will address the production methods, market, styles, culture, and misconceptions of cider, exploring how producers are using its identity crisis to expand its appeal. It’s Cider Week in NYC and Jimmy talks to a number of industry experts. Jenn Smith from the NY Cider Association, Eleanor Leger of Eden Cider, Kyle Sherrer from Graft Cider, Gidon Coll from Original Sin, and Ron Sansone of Spoke and Spy Cider gather around in the studio. They have lots to say about celebrating orchards, pairing cider with food, and the relationship between cider, beer, and wine. Michelle McGrath, the Executive Director of the US Cider Association, calls to talk about the support cider needs to grow as an industry. Mike Beck from Uncle John’s Cider Mill in Michigan dials in next to discuss what styles and marketing strategies are gaining traction. When people think cider, usually one style comes to mind and that’s what these industry leaders want to change. In this episode, we’ll look at co-fermentations and variations on the process of yeast eating sugar and releasing carbon dioxide. We’ll hear from Keith Cohen of Orwasher’s Bakery, Nina White of Bobolink Dairy and Bakehouse, Tracy Chang of PAGU, Marika Josephson of Scratch Brewing, and, of course, co-authors of Modernist Bread, Nathan Myhrvold and Francisco Migoya. Industrialization, and the semi-dwarf wheat developed during the Green Revolution, created a disconnect between farming and flour. But now, consumers are rejecting these commodities and rediscovering the foods, flavors, and farmers around us. We’ll hear from author William Alexander, baker Ellen King of Hewn, Henry Blair of the Greenmarket Regional Grains Project, “The Grain Lady” Mona Esposito, miller Jennifer Lapidus of Carolina Ground, and, of course, co-authors of “Modernist Bread,” Nathan Myhrvold and Francsico Migoya. Welcome to Season Two of Modernist BreadCrumbs! Kat Johnson, Hannah Fordin, and Jordan Werner Barry joined the Shacksbury Cider team for their annual Harvest Camp (also known as Shackscamp)! Hosted at Camp Betsey Cox in Pittsford, Vermont, Shackscamp was filled with three days of apple foraging, cider drinking, cheese tasting – to name a few of our favorite camp activities! We gathered the whole crew around a picnic table to record a special on-location episode of HRN Happy Hour with guests Luke Schmueker, Krista Scruggs, Neal Hirtzel, Cassidy Gardner, Matt Wolf, Jesse Galdston, and many more. Episode 56: "Beers With(out) Beards"
Grace Weitz is a craft beer enthusiast and writer for Hop Culture Magazine. She recently completed the Food Studies Master Program at NYU, and she’s one of the women behind Beers With(out) Beards, a celebration of women in the beer industry. Grace and Jordan talk about Food Studies, beer, cider, and how they're working to bring those things together. Episode 8.5: "Malus – Bonus"
Life, liberty, and the pursuit of cider? That may not be quite how the final draft of the Declaration of Independence turned out, but American Independence, and maybe even the Declaration’s writing, was fueled by fermented apples. Today, America’s cider industry is holding on to that independent streak, carving out an identity in a crowded market of beer and wine drinkers. The industry has grown from near nonexistence after Prohibition to more than 800 cideries in 48 states. That independence carries through to cider media, too, in the form of an independently published, print-only, advertisement-free cider zine. Today, Jordan Barry brings us the story of Malus in a special "snack-sized" episode. Episode 74: "Toast, Burnt and Otherwise"
Episode 73: "Spice is Nice"
Episode 72: "A Good Morning To You"
In French, "jolie laide" means "pretty and ugly"; it's a way to describe something that is unconventionally beautiful. This homage to jolie laide foods will explore the idea that deliciousness can come where you least expect it, from misshapen fish meatballs to organ meat that only a zombie could love. Some consumers may fall for the illusion of perfection, but companies such as UglyRipe and Imperfect Produce have made a point of promoting flavor over façade. (Bruised tomatoes may not be the most slightly, but they make a great sauce!) We'll examine the notion of perfection of taste vs. perfection of image. Episode 70: "The Bubble on Bubbles Hasn't Popped"
The history of effervescence has lots of wellness-related side notes, from the ground springs of Selzen, Germany (where the bubbly liquid naturally occurs, creating a sparkling mineral water) to the time when American speakeasies served “medicinal” fizzes flavored with homeopathic tinctures, directly influencing our soft drink and cocktail culture today. We'll explore the revival of soda fountains, like Brooklyn Farmacy, which serves carbonated egg creams replete with live-culture kombucha. There's more, too: Bread starters bubble for long-fermented loafs, boiling pots of bone broth extract all the good flavor and well-being benefits, and cider and Champagne cheer a food world that sparkles just a little brighter... all thanks to bubbles. Episode 69: "The Longest Wait"
Whether it’s a food fad or a table at the trendiest restaurant in town, there are certain foods that just inspire people to line up and wait. So what makes for a culty bite? Hear stories of triumph and despair, along with tactics to bide the time while you wait to get in the door for that prized morsel. We’ll also touch on the psychology and science behind waiting in line. Episode 68: "Tapping Into the World of Maple"
Episode 67: "How to Throw a Ripe Tomato"
Food fights have long played a role in many cultures. Why do we love them so? 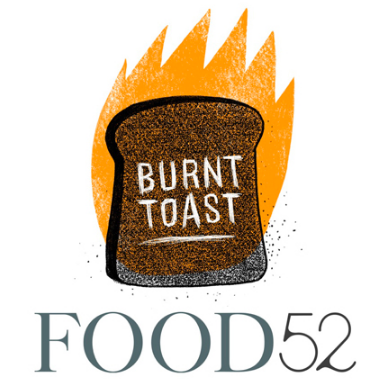 This episode of Burnt Toast explores the psychology of the food fight and discusses several of the most interesting ones, past and present. Every year, in late August, 50,000 people descend on the Spanish city of Buñol to paint the town red for La Tomatina, throwing thousands of pounds of ripe tomatoes at one another. There's also the so-called Battle of the Oranges held in northern Italy, where opponents re-enact Ivrea’s civilian uprising against the ruling tyrant of the 12th century, and Germany’s Gemüseschlacht or Vegetable Battle, outside of Berlin, where a salad medley is flung through the air. We'll also speak with professional baseball players on how best to prepare to launch an aerial assault. Last month we were on location at the RAW Wine Fair, celebrating some of the best natural, organic, and biodynamic wine talent in the world. Besides sitting down with the fair’s founder, Isabelle Legeron MW, we chatted with the winegrowers pouring at one of the fair’s busiest booths—Krista Scruggs and Deirdre Heekin of La Garagista. Bread is immeasurable, no longer bound by precepts. The new dictum of baking bread is built on shapes and sizes we haven’t even dreamt of. This episode, the proverbial breadbox of the series, will hold all the bits of bread we haven’t gotten to yet, or have yet to be made. Episode 2: "Erica & Baxter of Randall's Island Urban Farm"
Like Farmer, Like Dog is a series exploring the relationship between urban farmers and their canine companions in New York City. We’re taking a trek up to the Randall’s Island Urban Farm to meet Erica Harte and Baxter. Erica is a farmer and educator in the farm’s Edible Education Program. We spend a morning learning from Erica as she teaches a group of first grade students about how their food grows, sustainability, and urban agriculture. Then, we head back to Bushwick to meet Baxter and hear about his history as a farm dog and his life in Brooklyn. Episode 1: "Emma & Jam of North Brooklyn Farms"
Like Farmer, Like Dog is a series exploring the relationship between urban farmers and their canine companions in New York City. For many urban farms, these dogs are really the only animal representation they have, given the challenges of raising livestock in the middle of a city. In episode one, we meet Emma Gonzalez of North Brooklyn Farms and her dog, Jam. Emma – who is a chef, farmer, and event planner – found Jam through the Sato Project, which rescues dogs from Puerto Rico. We also hear from Henry Sweets, one of the cofounders of North Brooklyn Farms, about how Jam plays a huge role at the farm, despite her petite size. Episode 6: "Balls & Sticks"
Episode 5: "Against the Grain"
Episode 88: "Isabelle Legeron at the RAW Wine Fair"
One hundred artisans, six hundred wines, two days, one RAW Wine Fair. Created and organized by Isabelle Legeron MW, the RAW Wine Fair is a totally independent wine fair celebrating some of the best wine talent in the world; all focused on natural, organic, and biodynamic wines with low intervention in the cellar. Isabelle joins HRN Julia Child Fellow Jordan Werner in a quiet corner of the fair to talk about the natural wine movement, transparency, and the importance of storytelling. "The Old Adventures of the Newtown Pippin: Exploring history, terroir, and biodiversity through cider"
The Newtown Pippin originated as a chance seedling on the banks of Newtown Creek, which is now the dividing line between Brooklyn and Queens. This popular apple variety had a stellar international reputation in America’s early days and became a commercially important cider apple across the nation, from the eastern seaboard to the Wild West. As part of Cider Week NYC, we explored the storied history and geography of the Newtown Pippin as we tasted apples and ciders from orchards and cidermakers all over the country. 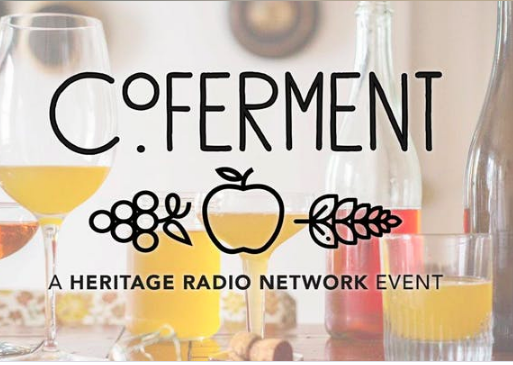 This episode of Heritage Radio Network On Tour is a special dispatch from Shackscamp—a weekend full of cider, cheese, and camaraderie hosted by the wonderful crew at Shacksbury Cider. The HRN team heads up to the Green Mountains of Vermont to work a little (and drink a lot). Get excidered! 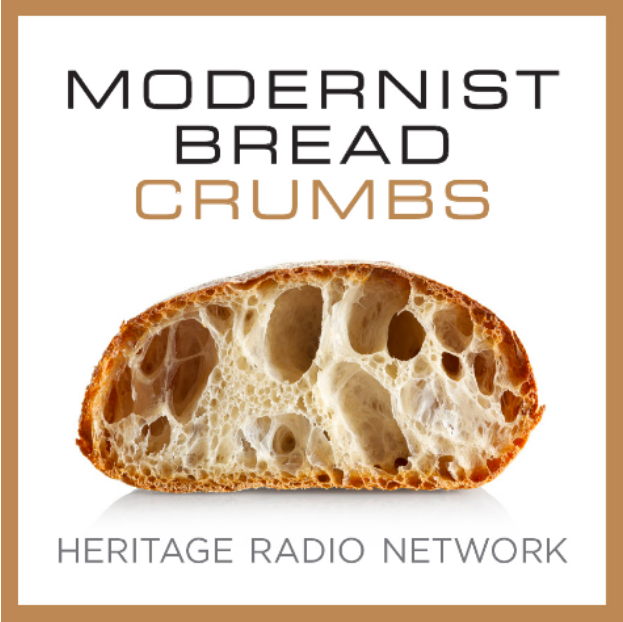 Episode 3: "On the Rise"
This is Episode Three of Modernist BreadCrumbs: “On the Rise,” on yeast, leavening, and fermentation. Here, we observe a microscopic single-celled organism from the fungi kingdom, and its full effect on bread: yeast. How can something so small make such a big impact? When it comes to bread, the proof really is in the proofing. Episode 2: "The Great Civilizations of Grain"
This is Episode One of Modernist BreadCrumbs: “Pre-ferment,” on the history of bread. In this episode, we take a look at ancient drawings on cave walls, dig through the ashes of a volcano eruption, and consider the primal evolution of bread as we know it. We hope you’ll loaf it. This week on HRN Happy Hour, Liz Mistick, Jordan Werner, Sarah McKeen, and Hannah Fordin are filling in for Kat and Caity. We’ve got all the usual hits, including show highlights from around the network, important events, and an update on our Summer Drive. After that, we talk Fourth of July. Even though it already happened, we’re still hung up on fireworks and BBQ. Jordan shares an interview with Amy Lipman, a food scholar and bonafide Hot Dog Expert, about the history of hot dogs and what they mean in American culture today. "Cider in Ireland: Creeping Craft Industry or Bulmers Blowout?" As part of her Master of Arts degree in Food Studies at New York University, Jordan traveled to Ireland to study the country's burgeoning craft cider industry. She found many similarities to the American cider boom, but also unique barriers, both cultural and political, that have stalled the growth of Irish cider. Click here to read the series. While working as a manager and barista at a line-out-the-door-busy specialty coffee shop in Lower Manhattan, Jordan put her caffeine-fueled brain to work writing about coffee and café culture. "Filtered Thoughts" is a capsule blog project, exploring everything from tasting notes to coffee travel, with plenty of customer frustrations in between. As the Field Editor, Jordan wrote long-form articles for various sections of Vermont Magazine, including "Vermont Homes & Gardens," "At Home in Vermont," and "At Work in Vermont." She also curated the bimonthly "Essential Events" and annual "Summer Arts & Culture Calendar" features. Click here to read selected articles.